Speaking of treatment, and since you’re probably wondering what a martial arts blog has to do with Parkinson’s – the defining feature of the disease is diminished muscle control. This manifests in several ways: tremors, stiffness, slowness, and loss of balance among them. With complications like these, your first thought might be that exercise isn’t a good idea for Parkinson’s patients. We’re all familiar with the old joke about the person who goes to the doctor complaining that it hurts when they raise their arm, and the doctor says, “Well, then, don’t raise your arm!” If movement is what’s being affected by Parkinson’s, wouldn’t it be better to not move? In fact, the exact opposite is true! Not only does exercise (paired with a healthy lifestyle!) potentially reduce the risk of getting Parkinson’s in the first place, but following a diagnosis, exercise plays a crucial role in slowing the disease’s progression and reducing the motor symptoms! High-intensity training that works coordination and reflexes is especially beneficial. One nonprofit has been using this to help Parkinson’s suffers strike a blow to the disease – literally. 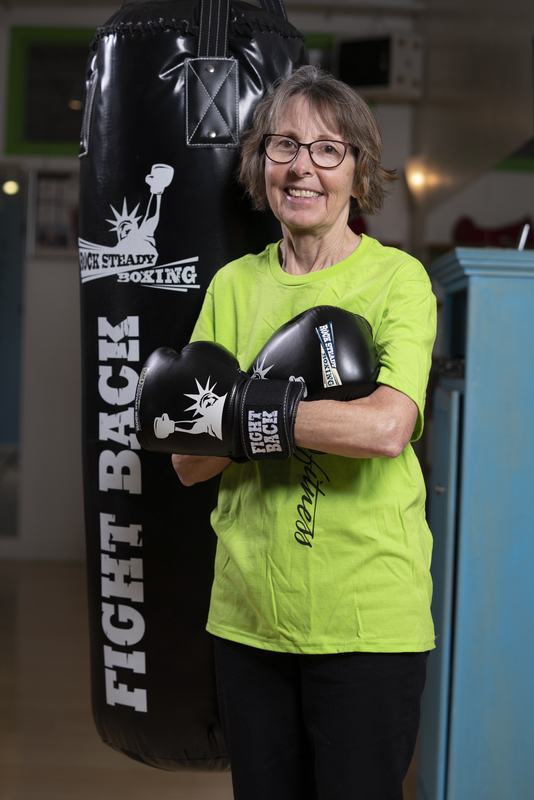 Rock Steady Boxing was created by Scott Newman following his own diagnosis with Parkinson’s in 2006. Newman was only 40 years old, working a busy schedule as the prosecutor of Marion County, Indiana, when Parkinson’s struck. Newman made the decision to strike right back! 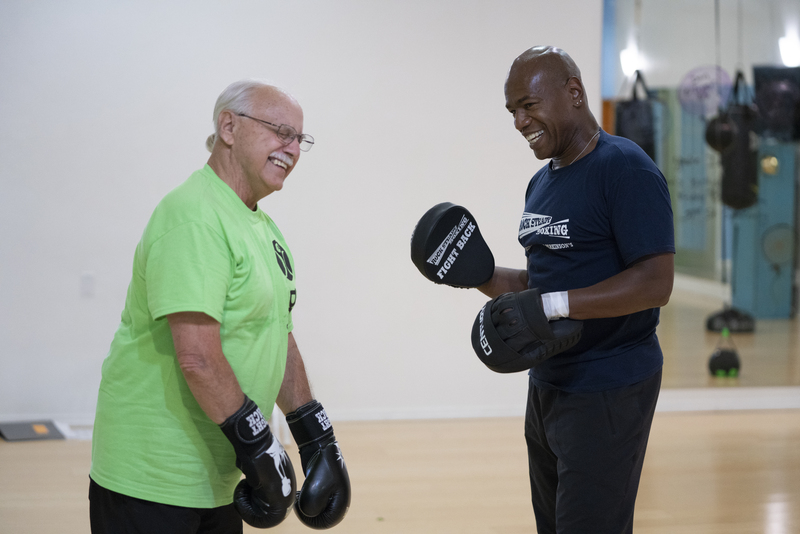 With help from his friend, Golden Gloves boxer Vince Perez, Newman began to learn boxing. After only a short time, he saw his symptoms drastically improve. 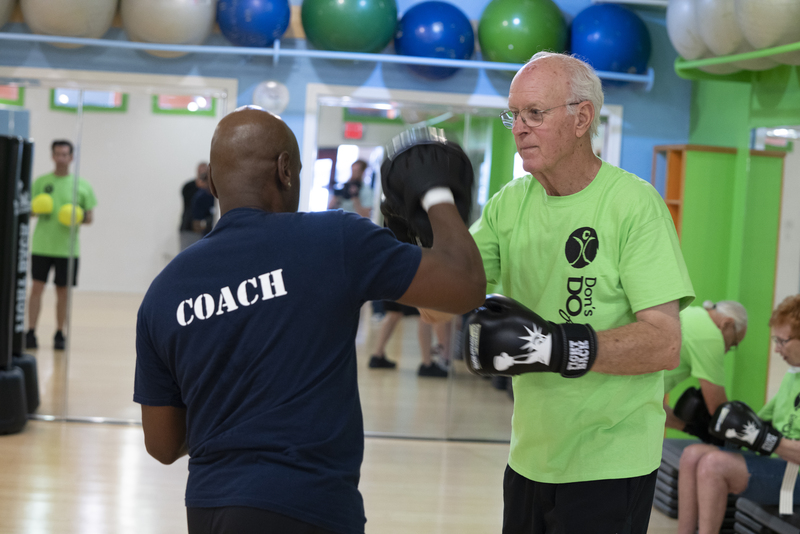 He and Perez founded Rock Steady Boxing, a 501 (c)(3) nonprofit to help bring the benefits of boxing to people with all stages of Parkinson’s, across the US and the world. Training at RSB involves partner training with certified instructors. A Rock Steady fighter laughs with his coach in between focus mitt rounds. A Rock Steady fighter poses with her gloves and bag. There are currently over 700 Rock Steady Boxing affiliated gyms in the US and around the world – make yours one of them! If you’re a martial arts school owner, see how you can become an affiliate and bring a Rock Steady class to your gym. You already know how to make a lifechanging difference. Help even more people with Rock Steady. If you’re not a gym owner, but you train regularly, bring up the Rock Steady program to your coach! Rock Steady also accepts donations, so no matter where you are, you can help fight back! No matter what else you do, if you know only a little about this disease, please take this month as an opportunity to learn a little bit more about Parkinson’s. Although there is no cure yet, I have confidence that if any group of people, working together, can deliver a knockout blow to Parkinson’s, it’s us: martial artists!